IBM HACMP 5.x for AIX 5L (V5.1, V5.2, and the new HACMP 5.3) has introduced major changes to the well-proven IBM high availability solution for IBM eServer pSeries clusters. The changes include product usability enhancements, performance, and integration with the IBM strategic On Demand initiative. 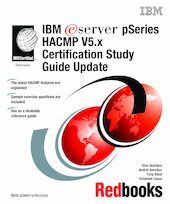 This IBM Redbooks publication provides information for system administrators who want to implement high availability clusters with HACMP V5.x, upgrade an existing cluster to the latest version, or prepare for the HACMP V5.x certification exam to achieve IBM Eserver Certified Systems Expert - pSeries HACMP 5.x for AIX 5L. This book helps AIX 5L professionals seeking a comprehensive and task-oriented guide for developing the knowledge and skills required for the certification. It is designed to provide a combination of theory and practical experience. Due to the practical nature of the certification content, this publication can also be used as a deskside reference.